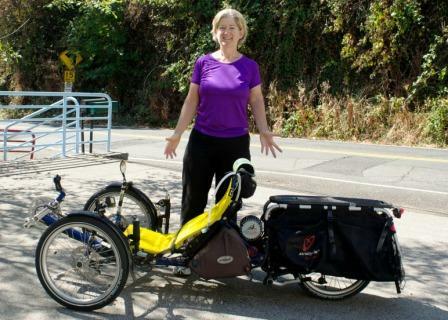 One of our customers, Sylvia Halpern shares her story of touring with a custom EcoSpeed system and tadpole trike she calls Moto Myrtle. After four days she was having so much fun she decided to just keep on going…and going…and going. At some point she wanted to make her journey even more fun and while climbing at a snail’s pace up long steep hills in humid Thailand, she start considering options. She wondered if anyone toured with electric assist. After doing some research, she found EcoSpeed and together with TerraCycle, we created custom a CargoMonster EcoSpeed kit which extended her trike’s carrying capacity and stability. Sylvia has since completed an amazing 6000 mile tour down the Pacific coast and across the USA with her EcoSpeed system. She said it was actually easier to find an electrical outlet than it was to find water on her trip. Sylvia Halpern and her trike Moto Myrtle with custom built EcoSpeed Mid-Drive. Even though she had toured without a motor for years it was on her e-tour that she started making progress toward one of her fitness goals. Along with changes to her diet and joining Weight Watchers by the end of the electric trike trip she had lost 25 pounds. Sylvia reflects on solo touring with electric assist, the advantages, and the limitations her batteries put on her route in her blog. Now having lost 60 pounds she has decided to try touring without a motor again and keep Moto-Myrtle as her car replacement vehicle for hauling when she is home in Portland or wants to ride fast. Her 2012 adventures include riding an HP-Velotechnic full-suspension Scorpion trike from Singapore to Beijing. Go, Sylvia, go!!! Sylvia has joined us for many group rides and has inspired many others to add electric assist to their rides and get out on their own adventures! We are so grateful to call Sylvia a friend! If you have questions about adding electric assist to your adventures or want to know about our new, lighter lithium tri-metal batteries please contact us or call 503 233 1580. Silvia Halpern must be a very, very strong woman! She say’s going up steep hills without an electric motor and climbing at a snail’s pace up long steep hills in humid Thailand? Wow!! I have a Terra Trike 24 speed trike and can’t even get up a 25% grade hill near my home. I have to get out of trike and push it up by hand. Wheeeeeeeeee! What a work out! Although lost 4 lbs. in 4 days. (That’s good.) Iv’e decided to buy an eco speed motor to be able to use my trike again. On a straight away it’s sooooooo much fun. However, when I see a hill coming up I get sick. When I heard about Silvia Halpern, it makes me feel so inferior. What a woman! She is my inspiration.